Finding the “next great thing” can be a tricky thing to do, because more often than not the next great thing turns out to be, well, not as great as we hoped. So with that said I am hesitant to utter those words here, so instead I will not call Jordan Peele that at all, but instead I will just tell you that he is a storyteller and filmmaker at the top of his game. Out of nowhere Peele dropped Get Out and with it opened a door into a world most had never seen before. Well now that I have had that peak behind the curtain, I want to see it all and let me tell you this, whatever we saw with the first effort, it only gets better. In 1986 as the world was gearing up for Halley’s Comet, Adelaide and her family are at an amusement park in Santa Cruz, when she decided to stroll off and what she found would change her. Fast forward some years later and Adelaide (Lupita Nyong’o) has a family of her own and they are going back to her childhood home. 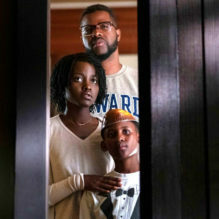 In tow is her husband Gabe (Winston Duke), her daughter Zora (Shahadi Wright Joseph), and her son Jason (Evan Alex), who have come for a little R&R. Things seems pretty normal, but when Gabe suggests they go to the beach, the same one Adelaide visited in her past, she isn’t too keen on that idea and only gives in after a little arm twisting. Once there, Adelaide never drops down her guard and when Jason goes missing for a bit she is done with the beach and is ready to head home. Once there something doesn’t feel right, like something is pulling towards her and those fears come true when a family of four show up with a plan and a familiar look about them. What follows seems like the unthinkable and the question becomes will Adelaide and her family survive what’s to come? Now most people are all aboard the Jordan Peele train as the next great master filmmaker, but I have seen enough people hit it out of the park on the first pitch, only to strike out at the next at bat. Good news is Peele does not strike out and in my eyes delivers something even better than his first go around. Opening with a television sounded by VHS tapes, Peele sets the table and is ready to give you clues to what you are about to see. With the perfect set up, Peele, who wrote and directed the film, takes us on a ride that blends sights and sounds together beautifully. While the story is strong, it’s taken to a different level with the help of the score by Michael Adels and what seems to be the perfect needle drop for every song that plays throughout the film. You can see that Peele is gearing up for his rebooting of The Twilight Zone on TV later this year as this plays like a movie length episode of the classic show. It has the ability to conjure a laugh, but never enough to break the mood, with an intensity that keeps you on edge. With Us Peele proves he is assuming a role that we all will be glad he is in and delivers a film that will make you ponder what exactly happens beneath us.